Did you know lack of organization in your life can affect not only your physical surroundings but also your physical and mental well-being? Clutter affects your ability to think, to focus, and even to relax. For children, having an organized space for homework allows for productivity and creativity. For adults, having an organized work space allows for productivity and efficiency. Having an organized home for children sets schedules and routines. For adults, having set schedules and routines make it easier to balance work, family time, and responsibilities such as financial planning and grocery shopping. To start 2019 off on a positive note, let’s take a look at some easy ways you can get better organized for a better you in 2019. Anything more than this will be too overwhelming and cause you to not start at all. Making a handwritten detailed to do list is important in staying organized. Written lists are very important in accomplishing tasks. Most importantly, hand-written lists are more powerful than typed lists. Why? Handwriting requires more thought and motor skills which requires more cognitive and memory function. 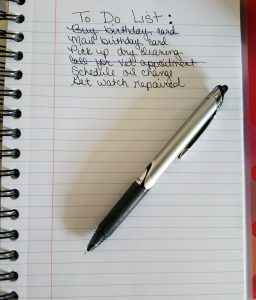 By having written to do lists, your memory can conjure up the tasks quickly and prioritize them with little effort even when the list is not directly in front of you. This allows you to plan your schedule to work on the list throughout the day, when time permits. 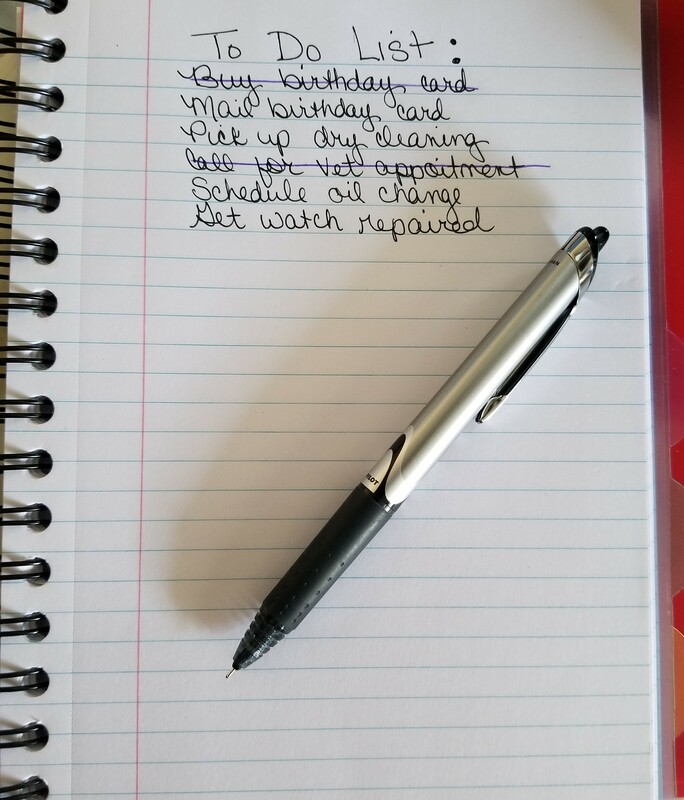 In addition, writing lists allow the satisfaction of achievement. When you accomplish a task, cross it off the list and feel the sense of accomplishment that comes with getting things done. One of the worst things you can do when attempting to organize a cluttered home is to look at the disorganized mess as a whole. This can be overwhelming, defeating and make you give up before you even get started! Don’t do this…instead, divide and conquer! Start by dividing your home into sections. Choose one room to start with. Start with just one section of that room – like the top of the dresser. Organize just that one area. Donate or sell any items you do not want or use. Once you have organized your first area in that room, congratulate yourself and move to the next area. Begin the process again! If you think getting organized is complicated, invite an organized friend over, and ask them to help. Organized individuals will help you stay on track, discard what you don’t need, and help you find a place for those random items you don’t know where to put. Some people just have a natural ability for organization, but for others, it’s just plain work. I’ve moved several times in recent years.The last time I was unpacking (for what I hope is my last move), I discovered I have nine hammers. Nine hammers!!! Apparently, each time I moved, I couldn’t find my hammer, so I just bought one. Over time, that gets expensive and takes up space. As you begin to organize and declutter, eliminate duplicates. Think about what you need and begin to downsize. You’ll be amazed at what you truly need versus what you think you need. If you haven’t used it in the last six months but don’t want to get rid of it just yet, box it up and label it with the date. If three months goes by and you don’t miss it, donate or sell it. Yard sales, selling apps or social media are a great way to make some extra money , BUT don’t hang on to it until you “get around to it….” Donate it to charity, or you’ll end up back in the cluttered mess you started with! Simply taking the time now to put these few actions into place will help create a more efficient, better balanced and stress-free environment in the home and workplace. 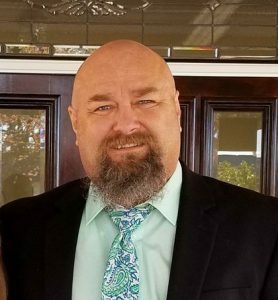 I hope that you find yourself healthier and happier in 2019! To find out more information about 4-H programs that can offer essential life skills such as independence, organizational skills, and goal setting, to your children or to volunteer your time to work with children in your area, please contact your local UF/IFAS County Extension Office, or visit http://florida4h.org. A happy 4-H member’s smile is contagious in this face-friendly clover costume. While Walmart has already jumped to Christmas season, many parents are still scrambling to figure out their children’s costume for October’s Halloween party. Now, all of us have the cutest pumpkins in the pumpkin patch, but none of our children want to dress up as pumpkins anymore! Gone are the simple days of our generation when white sheets with eye holes were the extent of our Halloween attire. With the hectic schedule of the world and the complicated costumes of today, here are a few guidelines to follow when helping children choose Halloween costumes (and keep them safe safety during the spooktacular holiday season). 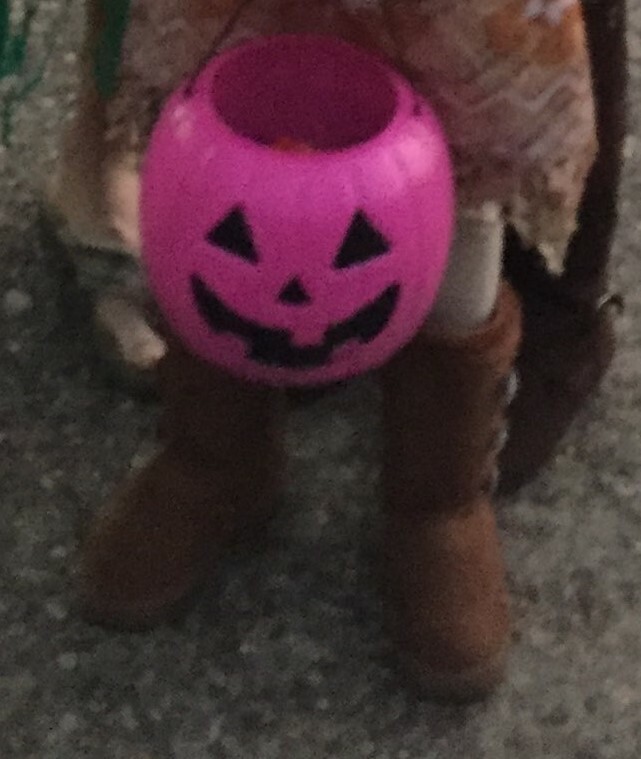 This little pumpkin has comfortable walking shoes for trick or treating. While cute or scary may be what the children are striving for, well-fitting costumes should be the goal for all parents. Ill-fighting costumes are a disaster waiting to happen. Costumes that hang loosely become a distraction. Capes, gowns, or any material in length that drags the ground can be a tricky thing to maneuver at any age so be sure to trim above the ankle. Speaking of ankles, shoes that are too high can cause unexpected hospital visits so keep shoes low to the ground and comfortable to walk in. Children (and parents) do a lot of walking to collect their candy treats. Shoes that are too large or too small can cause blisters and cranky children, all things to avoid on a fun night. One of the scariest things about Halloween is not what you can see but what you can’t see! 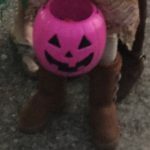 Not being able to see children in costume in poorly lit areas of the neighborhood can be scary for adults. 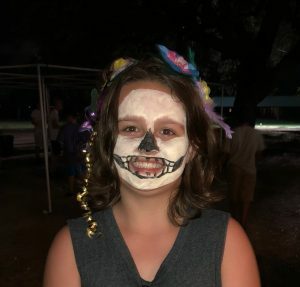 Parents, remedy this by using inexpensive reflective paint or tape to make children’s costumes visible or giving them glowsticks to wear or flashlights to hold. Be sure to think about if your children can see well in their costumes. Masks can be difficult to wear if they don’t fit well. Be sure that eye and breathing holes are extra-large. If a costume can be complete without a mask, consider skipping it and use makeup. If costumes are come with hats, scarves, or capes, secure them down with velcro to keep from hitting others. Does my Makeup Look OK? Children love face paint and makeup, and hair dye appears to be the latest trend. Halloween seems a good fit for these outlets, but use them with caution. More and more children are sensitive to pigments found in everyday items – makeup included. Your children may be going for the spooky look but not at the risk of it being itchy and painful. If your children will be using face paint, makeup and/or hair dye, do a simple test run at least a week before use to ensure there are no allergies to the ingredients. Makeup that does not obstruct children’s view is essential to their safety. You’ve probably heard that “accessories make the outfit,” but in the case of Halloween and children, accessories can be highly overrated. Parents usually end up carrying the accessories that went with their children’s costumes before the night is over. But if children insist their outfits are not complete without a Ninja sword or Katniss Everdeen’s bow and arrow, be sure they are easily distinguished toys. Those accessories should be soft and flexible. Whether you get into Halloween with costumes or not, these tips are good reminders for all of us to look out for children and keep them safe. Enjoy the upcoming holiday seasons! To find out more information about 4-H programs that can offer essential life skills to your children or to volunteer your time to work with children in your area, please contact your local UF/IFAS County Extension Office, or visit http://florida4h.org. Oh, the distress and worry that begins the feverish panic of the homesickness bug! It typically bites the week before camp for most parents and campers and hits its highest peak by day two of camp. Unless quarantined, the homesick bug runs rampant and causes quite a disturbance during camp week. There is good news: homesickness is like most any other mild allergy or summer cold; it can be prevented with the right measures. If it does appear, it can be handled quickly so campers are on the mend and back to enjoying the fantastic summer activities of camp life with little disruption! 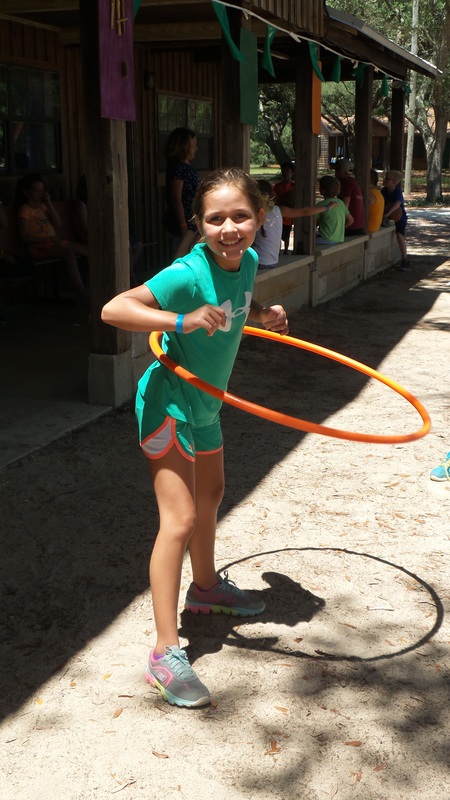 Campers who overcome homesickness and finish the entire week of summer camp successfully feel a sense of accomplishment and can also be praised for their demonstrating independence and problem solving abilities. These are life skills that 4-H residential summer camp strives to teach our youth so they can grow into successful leaders of tomorrow! Homesickness is a normal part of overnight camp. Here are a few suggestions on how you can help manage homesickness to keep your children healthy and happy this summer! 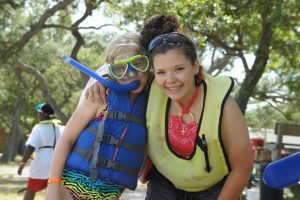 By going to camp orientations, meeting with camp staff, reviewing the camp schedule, and answering questions can help your child prepare for what to expect at camp. If possible, meet with the staff in charge to discuss any issues that may be giving your child anxiety about camp, or let us know of any issues at home that may be stressing your child. This might include include being assigned to a cabin with a friend, needing a nightlight when sleeping, etc. Having children involved in these discussions with staff in private will eliminate a lot of the anxiety, and in turn, reduce the chances and/or intensity of homesickness. Parents can unwittingly set their children up for homesickness failure before camp even begins with just a few simple negative statements. Statements from parents expressing their anxiety or sadness about their children leaving home can be damaging and ultimately lay a foundation homesickness. Please don’t be this parent. Instead, reassure your child they’ll do great at camp, and reinforce that they will learn new things and become more independent. Parents, remain confident from the time you sign your child up for camp until his/her children return home. Emphasize the positives of the camping experience such as making new friends, learning new activities, swimming, etc. Keep your camper excited about the experience to help diminish the anxiety associated with the week. Avoid giving your child the option of going home early from summer camp if he/she gets upset, sad, or homesick. Instead, speak with the 4-H agent to discuss possible actions that can be taken to remedy the emotions that the camper is feeling. Only as a very last resort should the parent speak with the child when a child is homesick; more often than not, it makes the homesickness worse. 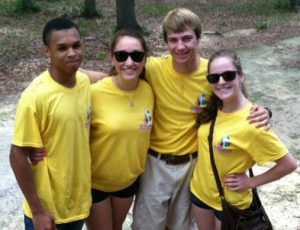 One of the hardest things to do may be one of the most important aspects of a successful summer camp for your child: trust your camping staff. From the beginning of the camp sign-up process, you can meet with your 4-H Agent or person overseeing the camping week. This will help you and your child feel more comfortable in their camp week. It will also help your 4-H Agent or lead staffer know more about their campers! 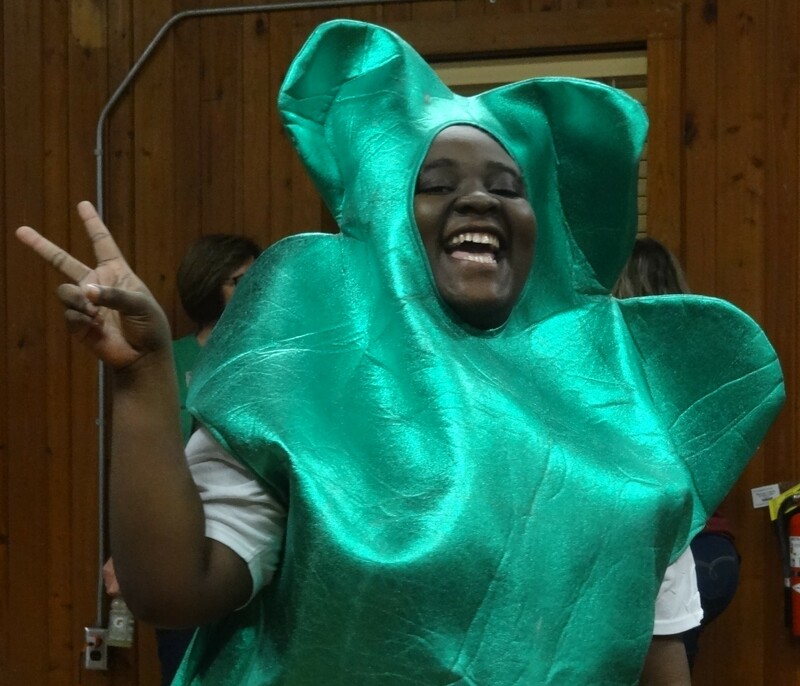 4-H residential summer camps are designed to support positive youth development to develop independence, promote a sense of belonging in a group setting, encourage generosity, and facilitate the mastery of targeted life skills. 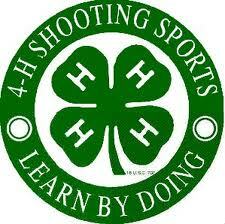 Programs at camp teach 4-H’s fundamental approach of “learn by doing” through safe, fun, educational environments. To find out more information about 4-H residential camping programs, please visit http://florida4h.org/camps_/ or contact your local UF IFAS County Extension Office. The month of March is here and therefore Spring is in the air. Our Cloverbuds are anxious to be outside with the warmer weather so a craft that has them up and about would be a perfect match. One of my all-time favorite Cloverbud crafts is the perfect activity for this time of the year, especially right before the Easter season. The project outcome will be perfect for your Cloverbuds to share with their families! Prior to conducting this activity with your Cloverbuds, you must do a little preparation with some of the materials. Cut a dime-size hole in each eggshell and remove the egg. Wash the eggshell with soap and water and allow the eggshell to dry. Once dry, fill the eggshell 2/3 full with a bright color of tempura paint. Cover the hole with tissue paper and lightly tape closed. Place the egg back into the egg carton. Repeat until you have 6-12 eggs for each Cloverbud, depending on the size of the canvases. Instruct the Cloverbuds in advance that they are to wear old clothes and shoes for this activity. Safety glasses are recommended for this activity. Set the canvases up in a line. Have the eggs several feet back from the canvases. 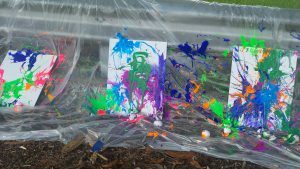 Instruct the Cloverbuds to toss the eggshells one at a time at their canvas, allowing the eggshell to splatter on the canvas and then drip down before picking up and tossing another one. 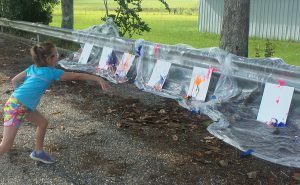 Allow each youth to toss one egg at a time so there is no confusion and they can all watch each other’s painting being made! 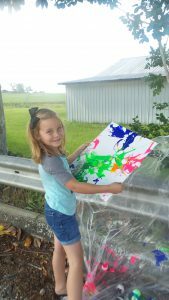 This craft invites Cloverbuds to expand their creativity by choosing colors to mix and blend on their canvases. By encouraging unstructured painting, youth are allowed to explore, experiment, and create art in a non-threatening and non-judgmental environment, fostering their creativity in a group that they feel safe and comfortable in. Younger youth are continuously working on physical competencies at this age and stage of development. This Cloverbud activity assists in the refinement of gross motor skills such as throwing the eggshell at the canvases. The physical action of aiming at the specific area of the canvas with the eggshell is working towards the development of fine motor skills. During reflection at the end of this activity, when all Cloverbuds share their final paintings with each other, youth are working towards developing increased social competence and communication skills. By having youth express how they enjoyed the activity, what they liked best, receiving positive feedback from peers and adults, and speaking before a group, they are increasing their ability to speak in front of others. By making them comfortable in a group that they feel safe, they will be more confident in themselves and their abilities at an early age. With this bright and beautiful Cloverbud craft, the finished project makes a wonderful exhibit for each Cloverbud to present to their family for the spring holiday season. It is a great reminder for youth to show their efforts, explain to others what they learn in 4-H, and practice their communication skills. To find out more information about other 4-H programs like this or volunteer your time to work with youth, please contact your local UF IFAS County Extension Office, or visit http://florida4h.org.